This week, Hire a Hero, Hire a Vet is excited to revisit an Orion alumna who is making a name for herself at Kansas City Southern Railway. 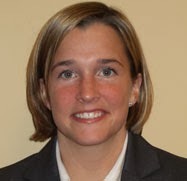 Kelly King, a former Adjutant General in the US Army, began working with Orion in November 2010 and started in her new position as a Director of International Rail Operations Support that December. Recently, she was promoted and continues to illustrate what great assets veteran employees are. In her initial role at KCS, King had many responsibilities, including ensuring optimal levels of productivity, providing timely information to ensure a quality transportation product is delivered, providing coaching and mentoring of both Collective Bargaining Agreement and professional workforce in a 24 / 7 / 365 operation, and pursuing best-in-class operational excellence. She also discovered many opportunities for career advancement. This advancement came in November 2013 when King was promoted to Assistant Vice President Advanced Systems as part of a reorganization of several operations department functions at KCS. In her new position, King is responsible for the implementation of Positive Train Control (PTC) and the integration of other various real-time technologies throughout the organization to help further and progress operations. “I have been with the company for three years and am excited at the opportunity and challenge of new tasks. Supporting the company in meeting certain rules and safety regulations is very important, and being able to help with the implementation of new technologies is an awesome and interesting undertaking. I am honored to be a part of the team,” explains King. Orion is proud to call King an alumna and hopes that her story inspires other hiring managers to consider veterans when adding to their team. You can learn more about King’s transition here.